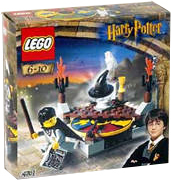 4701 The Sorting Hat is a Harry Potter set released in 2001. It contains a large platform with a spinning wheel at the bottom that has the four house mascots. The set includes 48 pieces and a Harry Potter minifigure. On the platform is a small stool with the Sorting Hat sitting on it, two torches, a list, two cups, and Hedwig the owl. The play feature is to sort Harry and other minifigures into houses by spinning the wheel and seeing what it lands on. The set is designed to fit in the Great Hall part of 4709 Hogwarts Castle. This set is based off of the time Harry was sorted into Gryffindor house right after he entered Hogwarts. This is a description taken from LEGO.com. Please do not modify it. (see an archive of the product's page) The Sorting Hat knows all! What Hogwarts™ house will Harry Potter™ live in – noble Gryffindor™, loyal Hufflepuff™, wise old Ravenclaw™, or cunning Slytherin™? Give the Sorting Hat™ a spin to reveal the answer! Includes Harry Potter and Hedwig™ the owl. Facts about "4701 The Sorting Hat"
ShopDescription The Sorting Hat knows all! The Sorting Hat knows all! This page was last edited on 19 July 2016, at 21:40.